If you are reading these notes, chances are quite high that you ALREADY rely on OpenWRT for some of your needs (Wireless; Embedded; etc.). In my case, I own a nice TP-Link WDR4300 that loooong time ago was “upgraded” to OpenWRT. For various reasons, last week I decided to run on it a software (pmacct, indeed) that was NOT included in the official package repository. how to build a MIPS-executable using a compiler running on an x86 platform?Answer to such a question is quite simple: cross-compilation. Basically, the GCC compiler can surely act as a cross-compiler, being able to run on several platforms (including x86) and creating executables for other, different, platforms (aka: targets) including several ones related to MIPS “ecosystem”. Unfortunately “cross-compilation” capabilities needs to be explicitly included inside GCC so… this means that you need a specific version (better: a specific “build”) of GCC. A “build” purposely built for your cross-compilation requirements. This is exactly where the Official OpenWRT SDK come to help, as it’s described with: “The SDK is a pre-compiled toolchain designed to cross compile packages for a specific target“. the PATH: by prepending the cross-compiler “bin” directory to the existing PATH. 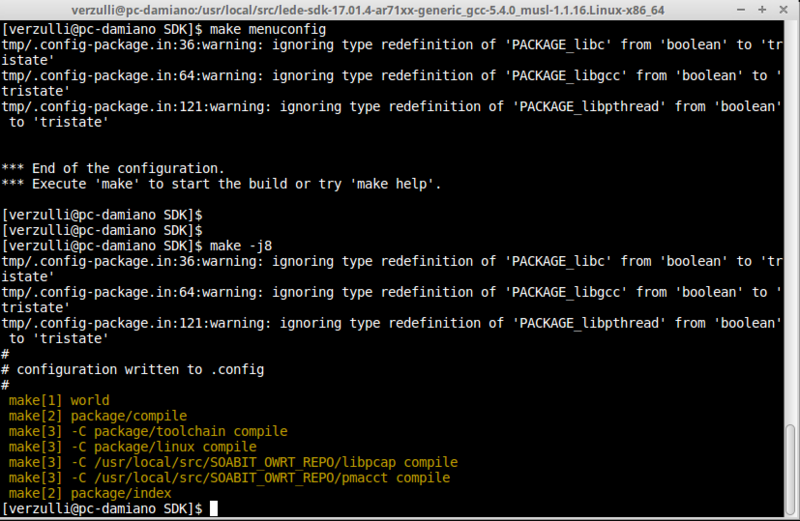 This is required so that the cross-compiler can launch its own tool (compiler, linker, etc.). using both che x86 compiler and the MIPS one. As you can see in line 3, the compiler properly built the x86-64 version, that actually succesfully run on my Linux box (lines 5 and 6). As you can see, the cross-compiler correctly built a MIPS executable and, as such, it CANNOT run on my (x86) machine (see the error message in line 5). As soon as I moved such a MIPS-binary to my WDR4300…. Bingo!… it worked! we built a MIPS-executable from a “.c” file, with a cross-compiler running on an x86 platform!And so? Can we shout “Uau! Finished!” ? Unfortunately not. Up to now… we are simply able to build a MIPS binary from a single “.c” source file. Nice result…. but not enough! As you might guess, PMACCT is built around much more than a single “.c” file. Actually a whole cycle of “configure” and “make” is required to build it. And so? How to cross-compile a WHOLE, autoconf/configure based application (…instead of a single .c file)? This is where things start getting interesting…. as the official documentation, unfortunately, is lacking lots of detail: the official Hello World Tutorial is really well-written; but unfortunately it doesn’t go much beyond the simple “helloworld.c” example. The good news is that… I’ve been succesfull, thanks exactly to the SDK. I struggled quite a lot in understanding the “insights” of the SDK. It was easy to understand “the main figure” (aka: the SDK as a tool to build “packages” and/or “kernel-modules” WITHOUT requiring to build “the whole world”). But, unfortunately, behind such a “main figure”, lots of details were hidden. Indeed, when you know about SDK…. when you get “comfortable” with it… when you have already and successfully used it a couple of times…. than everything sounds very easy. But I guess that if you’re reading these notes, chances are high that it’s your “first time”, so you –like me– are struggling a bit. In such a scenario, my goal is that following notes will result very helpful. Hopefully. So, here follow a numbered-list of items that can quickly help you in “getting the whole picture”. I’m sure you already know about “OpenWRT packages”. It’s amazing that, once connected via SSH, you simply launch an opkg install tcpdump and in a few seconds you get the “tcpdump” package downloaded and installed on your box. In order to keep things under control, multiple feeds have been created so to “group”/”classify” the various package repositories. Right after the download/unzip of the SDK, if you don’t perform other actions, basically the SDK is “useless”. Better: it can be used but only in the way we used it here above; to compile stand-alone “.c” application, without any chances to deal with openwrt packages or complex autoconf projects. In order to deal with packages (rebuilding existing ones or building new ones) and/or complex application (going trough complex “configure & make” cycles), you need to “PREPARE” the SDK. I’m sure you already guessed one of such actions: updating the feeds, so that the SDK for itself will know WHERE to download packages sources, should it need some of then during the rebuilding and/or compiling activities. remote: Counting objects: 9035, done. remote: Compressing objects: 100% (7608/7608), done. Ricezione degli oggetti: 100% (9035/9035), 10.89 MiB | 2.18 MiB/s, done. Risoluzione dei delta: 100% (1827/1827), done. remote: Counting objects: 4189, done. remote: Compressing objects: 100% (3535/3535), done. Ricezione degli oggetti: 100% (4189/4189), 2.54 MiB | 4.83 MiB/s, done. Risoluzione dei delta: 100% (180/180), done. remote: Counting objects: 3983, done. remote: Compressing objects: 100% (2264/2264), done. Ricezione degli oggetti: 100% (3983/3983), 3.75 MiB | 3.07 MiB/s, done. Risoluzione dei delta: 100% (822/822), done. remote: Counting objects: 386, done. remote: Compressing objects: 100% (320/320), done. 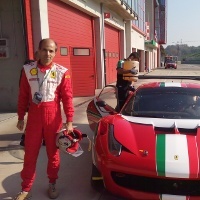 Ricezione degli oggetti: 100% (386/386), 256.71 KiB | 0 bytes/s, done. Risoluzione dei delta: 100% (27/27), done. Ricezione degli oggetti: 100% (250/250), 164.16 KiB | 0 bytes/s, done. Risoluzione dei delta: 100% (21/21), done. default feeds are defined in the feeds.conf.default file (this is going to be an important point for later discussion; so keep it in mind). Right after feeds-update, SDK is STILL useless. But in this stage… it’s useless simply ’cause it has nothing to do! So to step further we need to tell the SDK what to do (eg. : rebuild an already existing package or building a new package from scratch). Let’s start trying to rebuild an existing package. Let’s experiment with the tcpdump package. let the SDK to be able to “select” the building of the tcpdump tool. Now, in this stage, everything is in place and finally we can tell the SDK what we want (rebuild tcpdump). How? By firing the make menuconfig command, that will provide us the well-known curses-based interface, where we can define what we need. in order for the SDK to work properly, you need to define the STAGING_DIR environment variable AND update the ensure to point to SDK binaries, via properly prepending the SDK bin PATH to your pre-existing PATH variable. Very logic. And simple, actually. Don’t you? Back to the main menu, we enter the “Network” submenu and… guess what? we’ll find the tcpdump (and tcpdump-mini) options! This is exactly the results of the “feeds install” command that we issued before. Let’s tell the SDK that we want to build it, by pressing the “M” key (“M” stand for “Module”) on “tcpdump”. Than “SAVE”. Then let’s confirm “.config” as the filename to save, and then simply exit until getting back to prompt. ….let’s issue a “make” (actually, as I have an 8-core CPU, I’m going to launch a make -j8 ) and take the chance of a small walk, as the building process will require some time. The first is the one we required. The second has been automatically built by the SDK as it’s a REQUIRED DEPENDENCY for tcpdump. So we need it as well. we rebuilt a MIPS-based OpenWRT package (autoconf based), thanks to the SDK running on an x86 platform! Why? Because the PMACCT tool is available only as a “.tar.gz” and is NOT packaged inside some of the existing OpenWRT repositories. As such it CANNOT be “feeds/installed” and…. the whole process, above, CANNOT be applied. We have the SDK. We are able to rebuild an existing package with the SDK. But we don’t have “a package”. We have a (big) “.tar.gz”containing sources that can be compiled with “./configure ; make”. HOW CAN WE BUILD AN OPENWRT PACKAGE from such .tar.gz? Now, in this stage, you have all the required SDK components in place. What is missing is “the package” that the SDK is expecting for the rebuilding activity. The optimal way to solve this problem is really simple: define a new “feed” inside of which we’re going to put our new “pmacct” package. In order to define our own “package repository” (our own “openwrt feed”) we simply create an empty folder on our local Linux box and define such a folder at the top of the […]/feeds.conf file. Please note that the feeds.conf file is NOT included in the standard SDK tar.gz. This, ’cause normally the SDK rely on the “feeds.conf.default” file. But in our case, “defaults” are not enough…. as we need to add our own repository. So we simply create the new “feeds.conf” file and add, inside, what we need for our own purposes. As you can see, my own repository is going to be defined inside the SOABIT_OWRT_REPO folder. So I simply created such a folder and… everything should be ready to start hosting my own “packages”. To add our “custom” package inside our brand-new “custom” repository, it’s really simple. As mentioned in the official documentation, we simply need to create an ad-hoc folder for our new package and create, inside of it, a “package manifest file”. Actually, a “Makefile” specifiying how to deal with such a package. 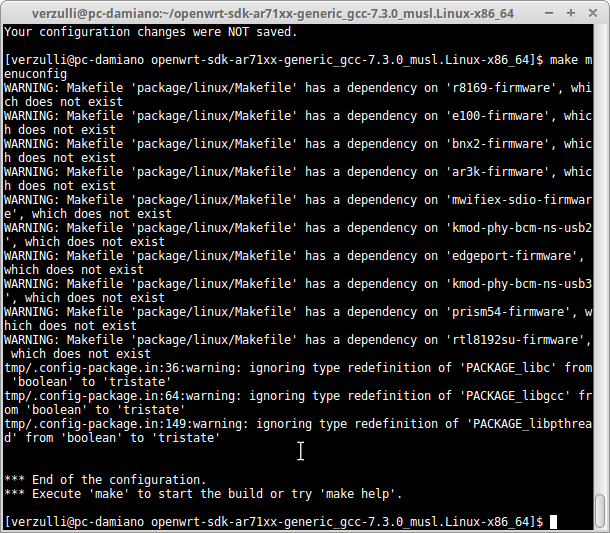 The REALLY BIG PROBLEM was figuring out HOW TO CREATE THE MAKEFILE for my PMACCT package. As I already stated above, the official documentation is quite oversimplied as the “Makefile” it provide is for the “simple” helloworld.c file and… as you know, now, our “pmacct” is quite a different beast. I finally was able to create the Makefile of my PMACCT package. 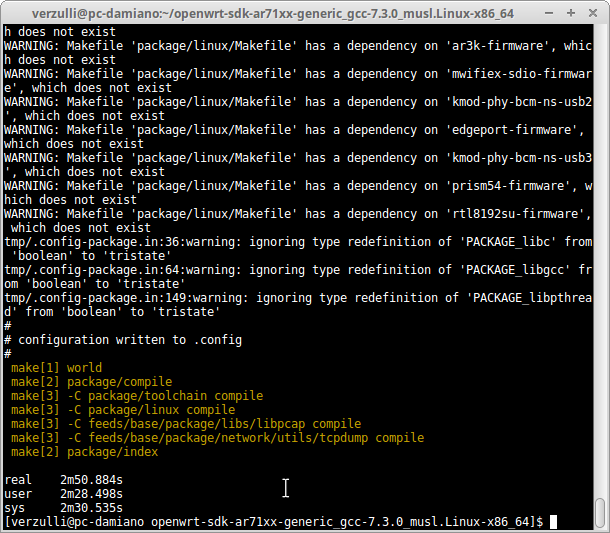 Following Makefile HAS NOTHING TO DO with the Makefile included in the pmacct sources. MAKE_FLAGS := CCOPT="$(TARGET_CFLAGS)" INCLS="-I. $(TARGET_CPPFLAGS)"
Now we simply press “M” to activate the PMACCT package and then “SAVE” the “.config” config file and Exit. As you can see, despite some minor warnings, everything has been built. Actually, even the “libpcap” package has been built (remember? libpcap is a “dependency” for our pmacct). Yes!!! Here it is! A freshly compiled pmacct_1.6.2-1_mips_24kc.ipk package!!!! We built an OpenWRT package starting from an autoconf-based “.tar.gz”! Now… it’s only a matter to properly configure the various tool but… this is definitily a topic for a completely different POST! Excellent post. I’m struggling to even get helloworld to work on mine. I’m using a Linksys WRT32x which is using an ARMv7 Processor rev 1. I’m using the following sdk: https://downloads.lede-project.org/releases/18.06.1/targets/mvebu/cortexa9/ which I think is right. I checked the file is there and that is has the execute bit… Any ideas on what I’m doing wrong? Hi Stephane, thanks for commenting. Unfortunately it’s not easy to “guess” the exact problem you’re facing. Anyway I’d start checking two things: 1) that your executable is really an executable built for the Armada385/ARM platform; 2) that you build a “static” binary, so that it (the binary) do **NOT** require additional files (aka: dynamic libraries). As for 1), it should be enough to launch an “file <path_to_executable>”. 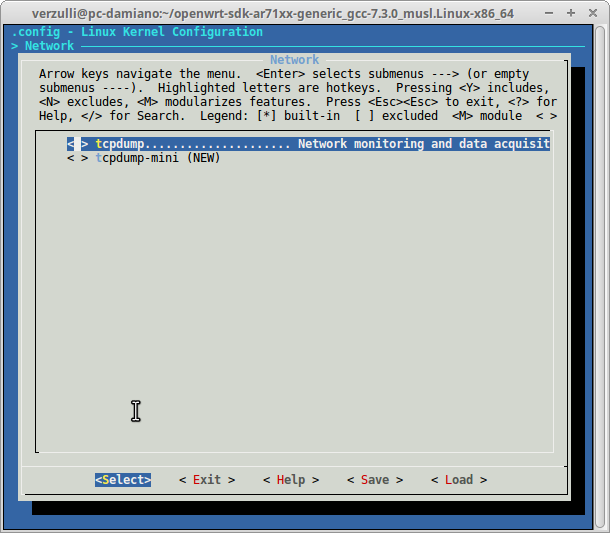 Those two commands should be launched on your Linux-box. If you want, you can cut-and-paste here related output so that, eventually, I can step further! It’s enlightening but it would be better with some more clarification where I struggled about . I had put Makefile in /usr/local/OWN_REPO/ and there are errors all the time! It may seem stupid but it’s worth mentioning if anyone has the same problem. Hi Robert, thanks for commenting! As for your own repo, are you referring to the “feeds.conf” file I described in paragraph 4.1? and it refers to the whole folder (/usr/local/src/SOABIT_OWRT_REPO) and not to the Makefile. What exactly should be better described? If you let me know, I’d be glad to further explicit the whole point. I am just starting out with OpenWrt using an RUT230 from Teltonika and this has been a very great eye opener. My aim is to be able to program my own software and build it in as a package into OpenWrt. I would like to write a package that utilizes Modbus TCP to read registers from a modbus device connected via ethernet and send the data to Azure IoT Hub. I do not want to reinvent the wheel. Could you be aware of any such a solution? In your opinion and experience, can it work? Hi Brian. I’m quite sure that something around ModBus/TCP have already been built for OpenWRT but… unfortunately I don’t have details. Let me add that I also had some “contact” with ModBus (and ModBus/TCP) also regarding Arduino and other “smaller” (with respect to OpenWRT) environment. This is a terrific tutorial for a complicated, error-prone subject. Thank you very much! With your help (and not a lot else) I was able to compile existing packages and run the hello-world on my WR710n. Excellent! Now I’m just struggling to compile an up-to-date package from Master rather than the outdated package in the stable version. Probably a simple thing but beyond my intuition. Excellent!! Needed that jump start.